AMURT UK is affiliated to the following organisations that share our mission and philosophy. AMURT’s global coordinating office is based in the US. At times of humanitarian disaster international AMURT chapters liase with this office to find out how to best support the AMURT chapter closest to where the disaster has occurred. This support may come in the form of fundraising, sending experts or additional volunteers. AMURTEL it is an organization managed by women, for women. Founded in 1975 to respond specifically to the problems faced by women and children in their struggle to meaningfully develop in all areas of life. AMURTEL helps to build solutions with women around the world to gain greater self-sufficiency and economic independence. AMURT Foundation has been working in Ebonyi State, S.E. 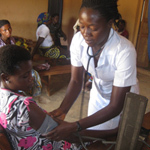 Nigeria since 2010 where the Maternal Mortality Ratio (MMR) was 1000 deaths in every 100,000 live births. It has spent the last 8 years developing a model of primary health care, which meets the maternal and health care needs of remote rural communities and puts the community at the centre of its strategy. It now has 8 highly functioning well attended Primary Health Centre’s in the state and the MMR for their project area is 176 deaths in 100,000 live births. AMURT Kenya works together with the Abha Light Foundation on the Spirulina Nutrition Project (SNP). SNP distributes spirulina to vulnerable children and mothers experiencing chronic malnutrition through Free Children’s Clinics (FCC). Presently, there are 22 FCC’s which distribute spirulina in Kenya. Each patient is given individualised treatment based on their specific needs and followed up to ensure optimum success. Since 2014 SNP has improved the health of 26,000 beneficiaries. AMURTEL Greece runs the Athens Refugee Mother and Baby Centre. It is the only woman-to-woman maternity service for refugees in Athens. It provides these vulnerable women with pre-natal care and examinations, preparation for labour, post-natal care, and breastfeeding/infant feeding consultations. Most women don’t speak Greek and have limited English. The care women get ensures they receive important medical tests and can ask questions using interpreters. This is vital for theirs and their child’s physical health, and psychological wellbeing. The application of this woman-centred model of care has proven to reduce the incidence of birth injury/trauma (physically and mentally) and reduce incidences of postnatal depression, as well as enhance chances of early and continued breastfeeding and bonding of mother and baby.